Mum of three Jenny is kept busy as a GP but although she doesn't get to spend a great deal of time with her teenage children, their family works. Until her fifteen-year-old daughter Naomi disappears one night. Jenny thought she had a close relationship with Naomi. She thought her daughter told her everything but as the investigation into Naomi's disappearance begins, Naomi's secrets unfold and Jenny realises she didn't know her daughter at all. I've been itching to read Daughter for ages and I am so glad I finally have. Daughter quickly had me hooked, desperate to know what happened to Naomi and whether the investigation would be successful. The book is told from Jenny's point of view and I couldn't help sympathising with her as she muddled through the stresses of bringing up three teenagers as well as keeping up with her hectic life as a GP. As a reader, I knew that something terrible was about to happen to her and her family but Naomi's disappearance is a complete shock to Jenny, especially when she starts to discover the things her daughter has been hiding from her. The book is told from around the time Naomi disappears and one year later, as the family is still trying to come to terms with losing Naomi. Jenny's daughter is still missing and her grief is palpable. Jenny's anguish and desperation pours from the pages as she attempts to move forward. She is no longer living a life but existing as best as she can under the circumstances and, again, I felt for her as she was stuck in limbo, not knowing what had happened to her daughter. Daughter switches quite frequently between the time periods, showing glimpses of the aftermath as the events of Naomi's disappearance take place. While this could slow down the pace of a novel, I thought it was a great way to tell the story and it really kept me gripped. If I'm honest, I wasn't overly keen on the way the novel ended but it didn't impair my enjoyment of the book as a whole. 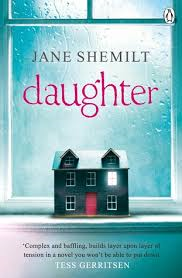 I loved it and thought Jane Shemilt's writing was superb. I'm certainly looking forward to reading more from her in the future!